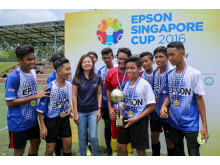 Singapore, 10 September 2016 – The Under-15 champion of the inaugural Epson Singapore Cup 2016, Team “Valentia C.F” emerged after two Saturdays of intense tournament matches at SAFRA Tampines. Battling for the ultimate prize of a once in a-lifetime training stint experience at the prestigious Valencia C.F Soccer School in Singapore, ten teams under the age of 15 took to the football pitch to compete in the 7-a-side tournament by Epson Singapore and Official Tournament Partner SINAD Sports. The training stint will be slated at the end of 2016. 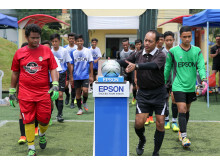 The Epson Singapore Cup is the latest CSR initiative by Epson Singapore to extend its outreach efforts in the local communities in which it operates, and is in line with Epson’s focus on youth development. Preliminary matches among 10 U-15 teams were held on 3 September. 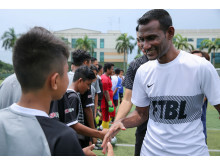 The teams received tips from coaches and players, including Assistant Head Coach/ Prime League Coach Mohd Noor Ali, Head Coach of Geylang International FC Hasrin Jailani, and players Shahfiq Ghani and Carlos Delgado. From playing fair and as a team to the importance of warm-ups, the youths were inspired to do their best. Preliminary matches for 4 September for Under-17 were cancelled due to insufficient qualified entries. The competition heated up today, as eight teams qualified for the quarter finals. The morning started with a briefing from Head Coach of Geylang International FC (GIFC) Hasrin Jailani, who advised them to watch the shape and formation of their teams as they play, balance between playing as a team and showcasing their individual skills, and display good sportsmanship. GIFC players Isa Halim and Mark Hartmann spoke to the teams, encouraging them to go the extra mile to push themselves to win, respect the officials and other teams, and enjoy the game. Teams who made it to the quarter finals were subsequently briefed by local football legends Lionel Lewis and S Subramani, to better prepare them for the matches. Team “Valentia C.F” emerged the winner after a nail-biting battle with hot favourites “Team Alpha” tied at 0:0, and a penalty shootout of 3:2 ensued. “Both teams played very well, though the players in Valentia C.F had more hunger in them. The first penalty kick was saved by the goalkeeper from Valentia C.F, which was the turning point that led them to being champions,” said Leonard Koh, Tournament Director of Epson Singapore Cup 2016. On the win, player Muhammad Ilyasa Bin Zul Haimi who scored the final penalty goal said, “The tournament is helpful to gain more and different experiences, so that we can learn from them and learn how to face them. We hope to learn more during the Valencia Soccer School training, about how to deal with and overcome different situations”. Ilyasa, who turns 14 today, is from Sengkang Secondary School. Title Sponsor Epson Singapore was encouraged by the results of the tournament. “As our first Epson Singapore Cup, we are encouraged and impressed by the mettle, skills and sportsmanship the teams have shown on the field. For our young champion, I wish them all the best and may the training stint bring them a step closer towards excellence in football. 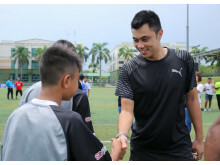 For the rest of the participants, I believe their dedication will not go unnoticed, and continue to pursue their passion and dreams in football,” said Ms. Tan May Lin, Epson Singapore’s General Manager (Sales, Marketing & Customer Service Division). Organisers will review the tournament and will announce subsequently if the tournament will be continued next year. For more information on Epson Singapore Cup 2016 and the tournament, please check out www.epson.com.sg/epsonsgcup2016 and https://www.facebook.com/EpsonSingapore .